Custom jewelry especially designed for the wearers style and personality to remind them of a special person, place, time, or event. ​​​Courage, pain, joy, and celebration of a new life expressed in a remembrance necklace. Now they are an active part of her wardrobe. It's more than just fashion jewelry it's a personal connection to her son through a custom necklace. Danae had no trinkets to symbolize her son's birth. I wondered how I could create such a thing that would symbolize her story in art form. I walked and prayed for days, God inspired me with these metaphors to express your journey thus far. One of a Kind: This necklace is intentionally created with love, thought, prayer and craftsmanship, just like you. It is meant to bring joy and be a connection with others. 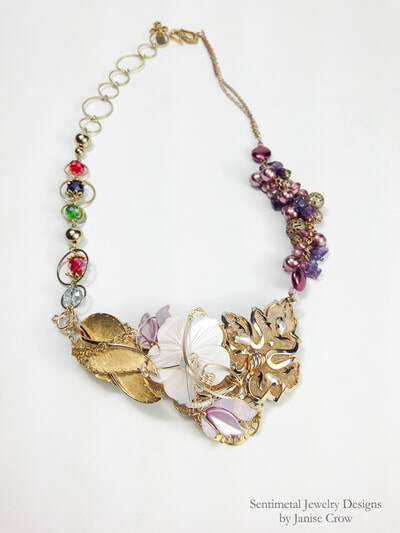 Starting with the clasp, the beginning and ending of the necklace. I placed a cross there, as I believe God is the Alpha and Omega and all things were created by Him with a purpose. Circles around colorful beads. Circles are rings, closed loops and represent unity. The union of a son's family. Each glass bead is the birthstone of the family member. First birth parents, then the adoptive parents followed by child. Golden leaves: which represent growth and prosperity lead you to the mother of pearl flower delicately adorned with lavender leaves. The focal a hand carved Mother of Pearl Flower, simple and elegant. Mother of pearl is the beautiful pearly internal layer of certain mollusk shells highly prized for their lustrous natural beauty. The hard surface makes it ideal for sculpting and shaping into beautiful new creations. The Pearl: Pearls are beautiful but aren’t formed without some pain. A grain of sand enters and layer upon layer of nacre, also known as mother-of-pearl, coat a grain of sand until an iridescent gem is formed. A pearl is the only gem created by a living organism. Throughout history pearls have been the gift of love. Danae, is the mother of pearl and her child is the pearl. She is a life giver and has given life to unique gem. We often view a difficult and painful situation as negative, when in fact it produces beautiful blessings. Just as grain of sand that found its way inside a mollusk. Danae's pearl was a gift of life given in love to build a family tree with strong branches and leaves with may pearls deeply rooted to flourish for years to come. Baubles of Purple Pearls. Purple is thought to be a color of royalty, because purple was often a color that was very expensive and difficult to make and manufacture. As such, royalty would often be seen wearing it. You are worthy and are the treasure in a much bigger family. vintage and previously loved costume jewelry that may have signs of visible wear, Janise considers this part of the charm and sentiment. it is created specifically for the wearer, the style, size, colors, ease of wear, length, and comfort are considered. 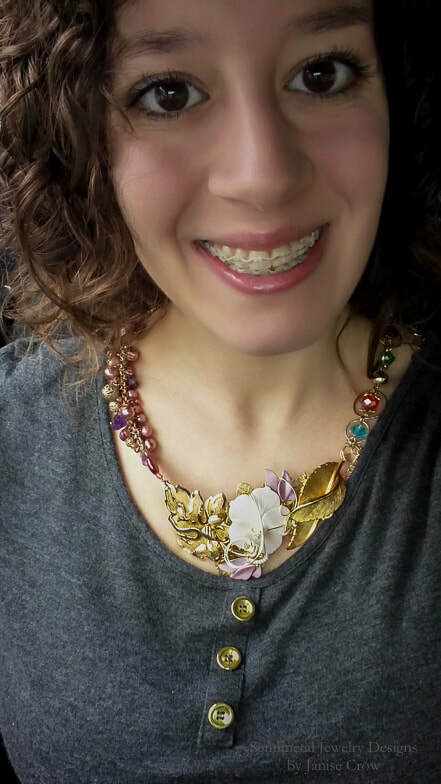 this assemblage necklace it is surprisingly comfortable and easy to wear, this is the perfect all-day necklace for dressing up jeans and a t-shirt. And it works equally well as a statement piece when you're style is slightly fancier. 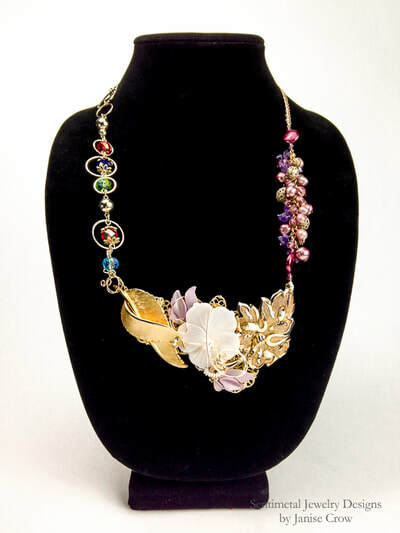 ​​This is an example of a custom designed remembrance necklace that uses tokens that hold special meaning to the wearer. In this case the client did not have any special tokens but desired to celebrate her past experience in wearable art form. 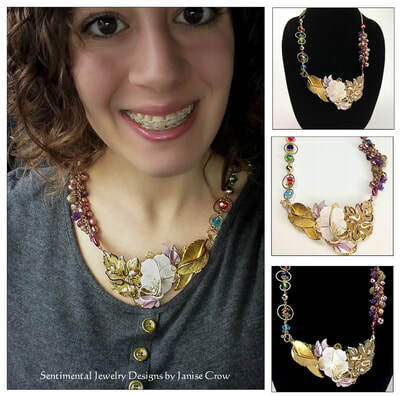 Janise artistically symbolized every detail of her story using birthstones, precious gemstones, color, shapes and placement to connect the meanings to a one of a kind piece of jewelry designed with the wearers personal style in mind. ​to provide all or most of the sentimental tokens, jewelry, or objects you would like to include in your custom necklace (extra fees may apply, you will be contacted beforehand). Once the order is placed, you will receive a confirmation email, with instructions and custom order worksheet where you can describe in more detail what you have in mind. ​How long does it take to create a custom necklace? After Janise receives your items you would like to include in your custom necklace along with your custom order worksheet, she can begin the process with you. This is a made to order item and there are many considerations since each piece is unique in its complexity. Please understand it will take time for Janise to consider your personal theme/story/sentiment, design your necklace and assemble it. 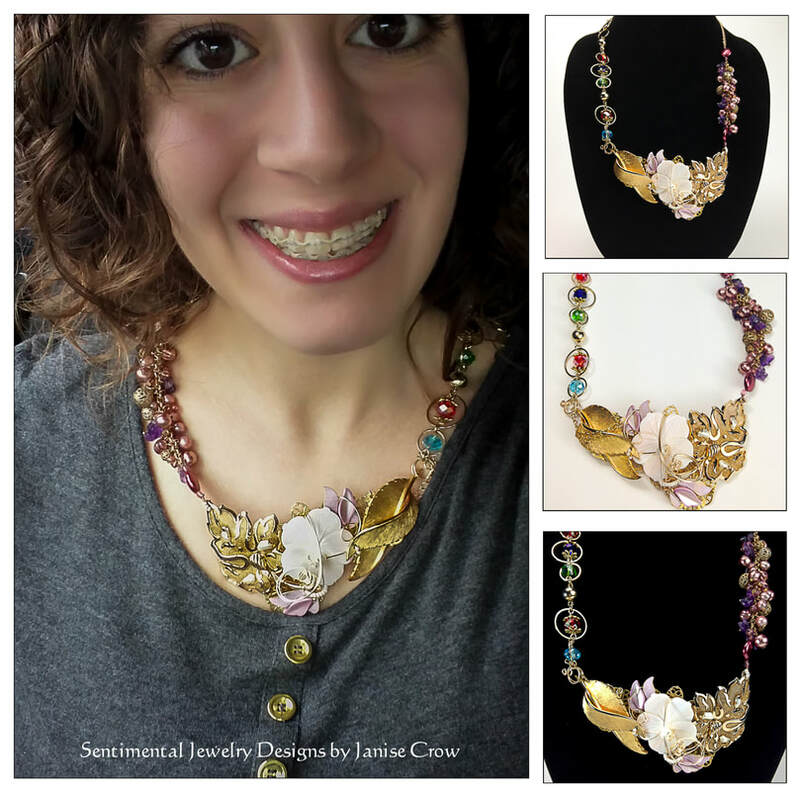 Janise does her best to meet all deadlines and is looking forward to working with you to create a truly unique heirloom necklace. Packaging: comes in a gift box tied with a ribbon, gift wrapping available. Shipping: from artist's location unless noted otherwise.